Invited guests include the Culture Secretary Chris Smith MP, local MP Jeremy Corbyn, the Mayor of Islington, and veterans from the Gay Liberation Front (GLF). 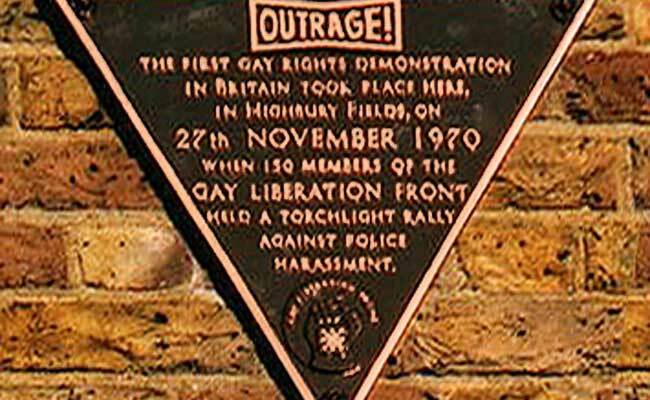 The solid bronze, triangular-shaped plaque commemorates the 30th anniversary of the first-ever gay rights demonstration in Britain, which took place in Highbury Fields on the 27th November, 1970. The original demonstration was a torchlight rally by about 150 members of the newly-founded Gay Liberation Front in protest against police harassment and intimidation. It had been provoked by the arrest of a prominent Young Liberal, Louis Eakes, during a police entrapment operation. Officers alleged that Eakes had cruised several men. He claimed he merely asked them for a light. The erection of the commemorative plaque has been organised by OutRage! and made possible by a generous donation from GLF veteran Andrew Lumsden, who will unveil it on the day. The plaque reads: “The first gay rights demonstration in Britain took place here, in Highbury Fields, on 27th November 1970, when 150 members of the Gay Liberation Front held a torchlight rally against police harassment”. It is being mounted on the public toilet in Highbury Fields, near where Louis Eakes was arrested and where GLF staged its torchlight rally in 1970. The erection of the plaque will take place with the help and permission of Councillors and Officers of the London Borough of Islington. “The GLF protest in November 1970 was a milestone in gay history”, said Peter Tatchell of OutRage!, who was himself a prominent campaigner in the GLF in the early 1970s.